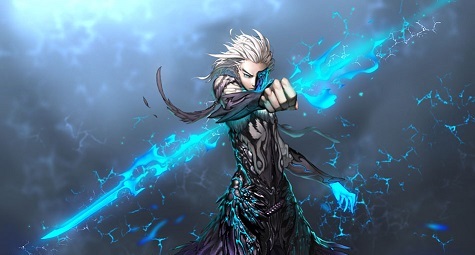 The electrical dual blade in my profile picture. however its a full blade no gaps like in the picture. / The blade itself is made out of solidified electricity and is very lightweight, roughly nine feet long. Effect: Can be split in the middle to create two 4.5 foot swords. They have natural electical properties so if they hit something that can pull a charge it will run through it and shock the person. Can shoot a lightning bolt from each one every 5 posts each. The bolts reach up to 20 feet from the swords tip. Would feel like you got hit by a taser. Drawback: can only shoot lightning every 5 posts, its lightweight so doesn't add weight to hits. 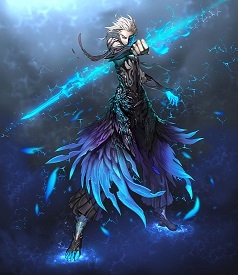 Armor in profile picture./ It is crafted from the skin and feathers of a blue phoenix giving it its properties. Ability/Effect: It has a natural resistance to fire based attacks, can be activated every 4 posts to heal minor to medium wounds pulling the properties from the feathers of the phoenix. This will also cleanse the body of any poisons. Explain the lightning bolts range and strength. All else is good. Ability/Effect: It has a natural resistance to fire based attacks, can be activated every 4 posts to heal minor to medium wounds pulling the properties from the feathers of the phoenix.